Are you looking for the perfect cake to complement your upcoming wedding? Our cake ball cakes are a beautiful centerpiece for your elegant event. 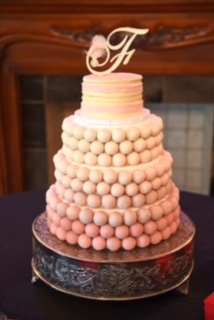 Our cake ball cakes are the perfect blend of modern and traditional and we can customize them to match any theme or color scheme. We are currently booking weddings 6 - 8 months in advance, so don't delay - contact us at info@cakebites.biz to schedule your consultation and tasting today.